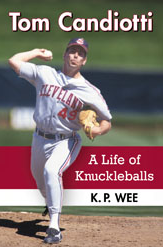 Yes, we’re almost a month into the 2016 season and this is only the first post of the new campaign here on A Life of Knuckleballs! (I guess our coverage here is just like “The Baseball Network” way back when – haha.) Yes, we know that Steven Wright of the Red Sox has surprised quite a few people with his strong start to the season – albeit with a losing record of 1-2 despite his 1.40 ERA – and it’s no surprise to me personally that R.A. Dickey continues to struggle, but the first post of the year deals with a couple of knuckleball pitchers from the 1980s and 1990s. And yes, I realize that it was 21 years ago this week that the Red Sox signed Tim Wakefield. But c’mon, he gets a lot of press – and has gotten plenty of accolades over the years – so I’ll take a pass on that one other than to mention this piece of history in one line. What we’re going to do instead here in this first post is post an interview that Seamheads.com, which covers the Red Sox, did with Tom Candiotti this week. As mentioned near the end of the hour (after Candiotti left), the guys noted the ex-Indian and Dodger knuckleballer averaged only one wild pitch per 30 innings for his career – great control for a knuckleball pitcher. We’ll post more stuff throughout the season, so catch up with you later!